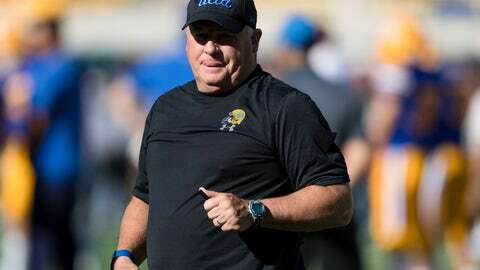 BERKELEY, Calif. (AP) — The final seconds of UCLA‘s first win of the Chip Kelly era ticked off and the Bruins gathered to celebrate with their traveling fans before performing a rousing rendition of their fight song in the locker room. Another one. Joshua Kelley punches it again for his 3rd touchdown of the game! BRUINS BALL. @Pick6Pickett recovers the Cal fumble to give possession back to @UCLAFootball. UCLA: Bruins freshman QB Dorian Thompson-Robinson was very efficient. He completed 13 of 15 passes for 141 yards including one that deflected off receiver Michael Ezeike‘s hands and right to teammate Caleb Wilson to set up Kelley’s first TD. He also did damage with his legs, including a 20-yard run that helped set up one of Kelley’s second-half scores.